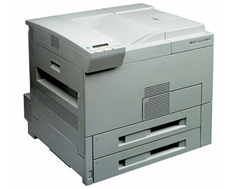 Introduced in 1998 and still surprisingly viable for office applications over a decade later, the HP LaserJet 8150 is an office printer designed for high-volume throughput, expandability, and more advanced network support than is available in many printers across HP's LaserJet series. The 8150 measures 22" by 21" by 22" and weighs 112.44 lbs, making it likely too heavy and slightly too large for a desk setting. It will sit comfortably, however, on a credenza, on its own table, or in a cabinet. Note that other 8150 models have significantly different measurements: the 8150HN measures 66.25" by 35" by 48.4" and weighs 236 lbs and the 8150MFP measures 43" by 25" by 64" and weighs 355 lbs, essentially requiring standalone furniture for both units. The 8150 prints at a still-respectable 32 pages per minute. Note, however, that duplex printing slows this to 24 pages per minute. 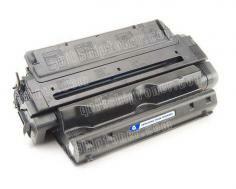 The 8150 is rated to print at a maximum resolution of 1200 dpi at full speed. The 8150 has a standard input capacity of 1100 sheets across three trays. This can be expanded to a maximum of 3100 sheets across four trays. Furthermore, duplex printing is standard, again reducing the need for add-ons. There are a number of optional add-ons for paper handling: the 8150 can be fitted with a 100-envelope feeder, a 3000 sheet stapler/stacker, a 3000 sheet stacker, a 7 or 8-bin tabletop mailbox, or a 5-bin mailbox with a built-in stapler, automating a number of tedious paper-handling tasks. The 8150 can print to standard media sized at Letter, Executive, Legal and Tabloid as well as envelopes rated at commercial number 10, DL, and Monarch. It can handle custom media sized from 3.9" by 7.5" to 11.7" by 17.7" and can handle paper, envelopes, labels and transparencies. The 8150 includes an HP Jetdirect print server with a 10/100Base-TX NIC standard, making it unnecessary to seek out and install an HP Jetdirect print server expansion card to connect the printer to a network. The Jetdirect print server also supports token ring networking if necessary. This makes up for the printer's lack of a USB port and makes it relatively easy to interface this otherwise legacy printer with contemporary computer equipment either in personal or office situations. 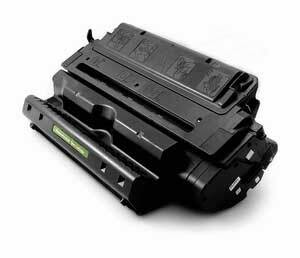 The 8150 includes additional features to improve networked printer administration, such as remote firmware upgrading, which allows the printer's Flash memory containing its firmware to be upgraded automatically over the internet. This does, however, require the addition of a special Web Access DIMM that stores the remote administration firmware. The 8150 includes 32MB of RAM standard, which can be expanded via three DIMMs to a maximum of 160MB. A 3.2 GB hard drive is also available as an optional memory expansion, though this does introduce another moving part and potential failure point to the device, worth considering when choosing to purchase and maintain a discontinued printer. The 8150 can also use its memory to store and retain jobs for later reference and use. The 8150 will not be usable in a non-network environment with non-legacy PCs, as the printer only includes IEEE-1284 parallel ports and support for deprecated Macintosh networking standards and infrared. Additionally, the 8150 only includes one parallel port, so in the event that you are using the 8150 with multiple legacy PCs, you will need to add a switcher in order to automate access to the unit. Though the 8150 can handle a high paper throughput as needed by a larger office, it cannot produce copies, send faxes, or scan documents unless you install the LaserJet MFP Upgrade Kit or purchase the base LaserJet 8150 MFP, which is much larger and heavier than the 8150.
Review it: "HP LaserJet 8150 "
The LaserJet 8150 requires new toner every 20000 pages rated at 5% coverage. Like almost all HP models, the toner cartridge includes a drum unit, bringing down the amount of maintenance necessary to keep the printer operational but possibly bringing up maintenance costs were one component to fail before the other.